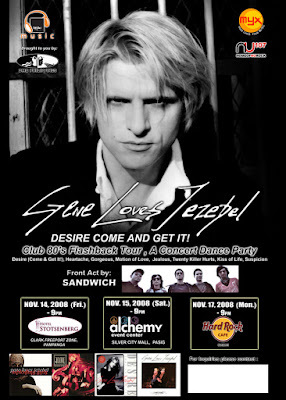 Paetechie Philippines News and Reviews: Gene Loves Jezebel Live In Manila Concert Tickets? Gene Loves Jezebel Live In Manila Concert Tickets? I remember in the late 80s, my kuya bought two tickets of Gene Loves Jezebel concert in Manila. Sdaly, the concert didn't push through for some reason and the tickets were never refunded for we had no time to to do so. We used to have tapes of their albums including Twenty Killer Hurts. It's just lately that a friend of mine emailed me an invite and sample concert poster to the Gene Loves Jezebel concert next month that got me excited. call Ticketnet at 911.555. Ticket prices don't come cheap at P1,500.00 at free seating.